I became the Children’s Pastor at Life Austin a couple of years ago. On my very first Sunday, I was encouraged to find that the main leader of the kid’s ministry was an excellent communicator. He could assemble a great lesson, and he was always very smooth with his delivery. It was excellent, but there was a problem. He was doing it all by myself. He spoke for 50 minutes. He knew that he was a skilled communicator, so he spoke. And he spoke and he spoke and he spoke some more. It only took me about 20 minutes to realize why most of my leaders had dropped off the face of the planet and stopped serving. His large group experience had killed off the small group environment. Regardless of how amazing you are as a communicator, it is very difficult to keep the attention of hundreds of elementary-aged kids for any length of time. What detracted my new ministries small groups experience was the the large group program. In addition to the lengthy lesson, there were a few things that distracted the small group experience that is common in many churches. Prioritizing the Environment over Relationships: I was stunned the first time I toured the kid’s area of Willow Creek Community Church. It wasn’t cool themes or amazing spaces. It was how they prioritized relationships over the environment. Our environment speaks to what we value most. Some environments speak to how valuable large group is to the weekend. This might include low lights, loud upbeat music, and chairs in stadium seating. These elements can be amazing – especially if Large Group is the priority. The problem is that this kind of environment isn’t small group friendly. Loud music doesn’t allow for small group leaders to have great conversations as kids arrive. Low lighting makes interacting with each other more challenging. Neat rows of chairs all pointed to the stage infer a priority to see the show rather than getting to know each other. These elements are great, but they communicate something that does not value groups. Lack of Preparation: The unprepared large group leader is a huge distraction. This host, storyteller or worship leader tends to rely on skill rather than preparation and rehearsal. They arrive on the weekend with a lot of talent, but no practice. This is what you can expect. 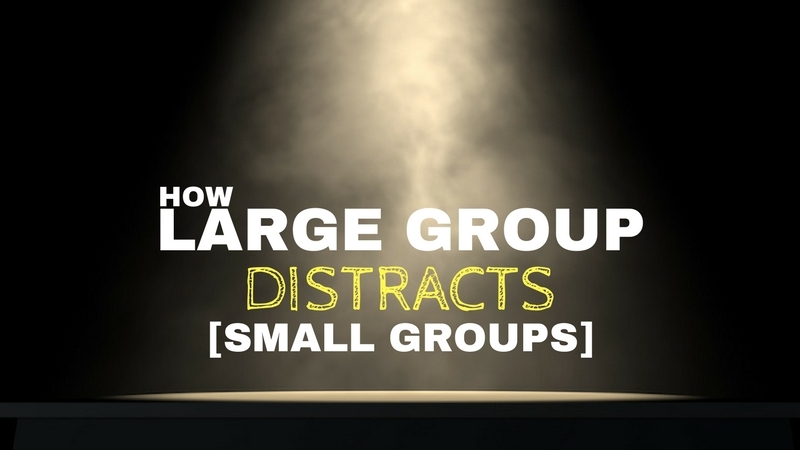 They will lose track of time and take the time that belongs to small groups. When this happens (and it does), small group leaders feel devalued. Additionally, unprepared large group leaders make a mess of the message. They end up being confusing rather than clear and small group get stuck with the mess. Ending Right: Some large group leaders take pride in their ability to get every child excited and pumped up during large group. A good small group leader can control the energy of the room like they had some kind of secret dial. In the words of Ben Parker (Spiderman) “With great power comes great responsibility.” Sending a bunch of hyped up crazy kids to small group is incredibly irresponsible. The small group leader will spend half of his time just calming the kids down. The best way to value groups is to find just the right balance. Sending them from large group on an up note rather than a rabid frenzy is key. This allows for a controlled hand off with kids still excited about what is next. Environments communicate more than we know. If we make a few changes our environments can go from taking value from our small group to building value into relationships. Mitch Royer is the Children’s Pastor at Life Austin. With over a decade of working in Kids ministry, his experience consists of a variety of mega churches including Willow Creek in Chicago, IL and Sun Valley Community Church in Phoenix, AZ. He is married to Stacy, and has 2 kids, a daughter, Fiona and a Son, McNeely James.